One more post for today. 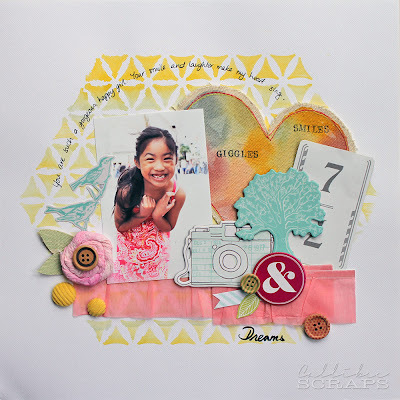 I promised that I would do more tutorials, and here is one that I did for one of the retreat layouts. 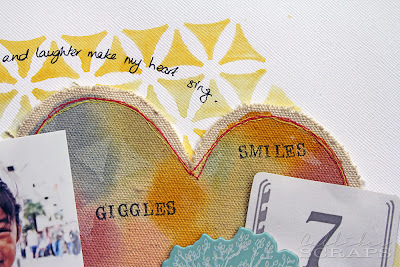 I think it works with the Tim Holtz distress paints really well and I just love the effect that came out. The background was created with the Crafter's Workshop Kaleidoscope template and Distress Paints. Here's a close up of what I want to show you. The canvas heart. 1. 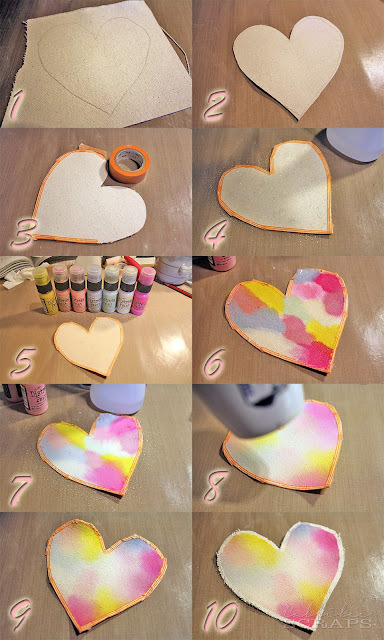 Draw a large heart shape in pencil onto a piece of canvas. Mine measured approximately 5" wide. 2. Cut out your heart. 3. 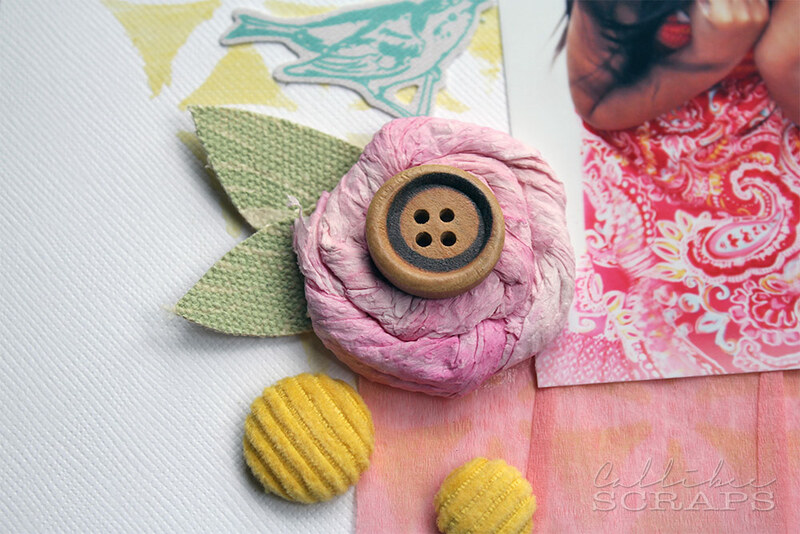 Using washi tape, tape up the edges of your canvas heart and seal it well. 4. Using a spritzer bottle of water, spritz the canvas until it is damp and absorbed. Blot off excess water. 5. Choose the Distress Paints you want to use. 6. Dab and rub the distress colours onto your canvas, in small segments. 7. Spritz the canvas with water and watch the colours blend and wick into each other. 8. Once you like how it looks, dry it with your heat gun. 9. This is what it looks like dry. 10. 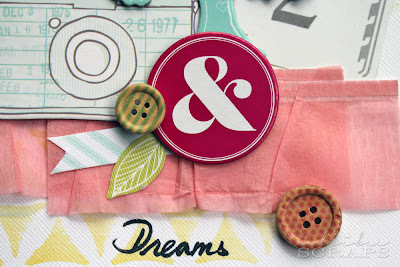 Peel off the washi tape and you're left with a raw border. You can fray the canvas a little to give it more texture. As you see from my close up picture, I then used white distress paint and randomly inked through the Kaleidoscope template. I also used my sewing machine to roughly sew two colours around the border and finally stamped on mini letters to finish it off. Here's something else I made for the layout. The pink rose is actually made from a piece of kitchen paper towel. It's basically a used paper towel, which I twisted and spiraled into a snail shell, before sticking on a button. The leaves were made from left over canvas. I stamped a swirl pattern with embossing ink on a patch of spare canvas, before heat embossing with clear embossing powder. I then dabbed on Shabby Shutters distress paint, before free-hand cutting out two leaf shapes. The stamped embossed areas create a resist effect. Another close-up on the layout. I hope you liked this tutorial and will try something like this for your next layout. I would love to see what you make.